Global Tumor Ablation Market is expected to reach USD 3,495.0 million by 2024 from USD 1,669.7 million in 2016, at a CAGR of 9.8% in the forecast period 2017 to 2024. The new market report contains data for historic years 2015, the base year of calculation is 2016 and the forecast period is 2017 to 2024. The major factors contributing to the growth of the market includes incidences of cancer patients, increase in the number of hospitals, ablation and surgical centers, technological advancement in ablation devices. On the other hand, stringent regulatory process would restrain the growth of the market. 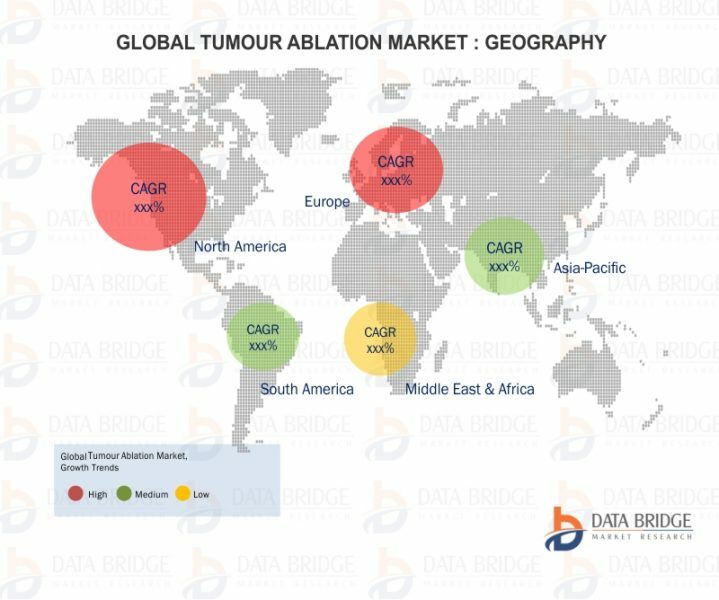 The global tumor ablation market is segmented on the basis of type, cancer type, mode of treatment, end user, and geography. On the basis of type, the market is segmented into three major segments which include tumor ablation systems, image guidance products, and accessories. In 2017, the Tumor Ablation Systems market segment is expected to dominate the market with 69.2%. Tumor Ablation Systems is further sub segmented into radio frequency ablation system (RFA), microwave ablation system, cryoablation, high intensity focused ultrasound and laser ablation system. In 2017, radio frequency ablation system (RFA) market segment is expected to dominate the market with 53.8%. On the basis of cancer type, the market is segmented into eight major segments which include liver cancer, brain cancer, lung cancer, bone cancer, kidney cancer, pancreatic cancer, breast cancer and others, The lung cancer market is expected to grow at the highest CAGR 10.7% in the forecast period of 2017 to 2024. Based on mode of treatment, the global tumor ablation market is segmented into surgical, laproscopic and percutaneous. The Surgical is projected to witness higher growth during the forecast period., The laparoscopic market is expected to grow at the highest CAGR 10.8% in the forecast period of 2017 to 2024. On the basis of end users, the market is segmented into hospital, oncology clinics, and others. In 2017, the hospital market segment is expected to dominate the market. with a share of 68.3%. Some of the major factors driving the market for global tumor ablation market are increasing incidences of cancer patients, increase in the number of hospitals, ablation and surgical centers, technological advancement in ablation devices. These factors increase the demand for devices such as tumor ablation systems and image guidance products. High treatment cost and side effects associated with ablation treatment may hinder the growth of this market. According to American Cancer Society, in 2017, approximately 1,688,780 new cancer cases were diagnosed and 600,920 cancer deaths were reported in the US. Many companies are increasingly focusing on technological advancement of devices in order to strengthen their product portfolios in the tumor ablation market. Medtronic is going to dominate the global tumor ablation market following with, Boston Scientific Corporation and Abbott along with others such as Galil Medical Inc., Perseon Corporation, NeuWave Medical, Inc., Koninklijke Philips N.V., INTIO Inc., Mermaid Medical A/S, SonaCare Medical, LLC, DFINE, Inc., Misonix, BVM Medical Limited, AngioDynamics, COMSOL Inc, EDAP TMS, and HealthTronics, Inc. In 2017, the tumor ablation systems segment is expected to account for the largest share of 69.2% of the global tumor ablation market, by type. This segment is expected to grow at the highest CAGR of 10.2% in the forecast period 2017 to 2024. Radio frequency ablation system segment is going to dominate the tumor ablation market owing to effective treatment for small cancers, minimal risk to patient, and faster results will drive the growth of the market. 1.20. NONINVASIVE MEDICAL DEVICES, LTD.